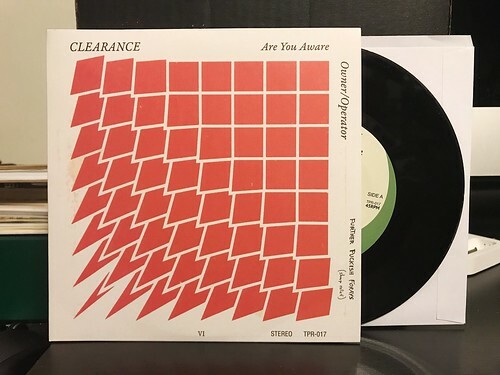 I Buy Way Too Many Records Dot Com: Clearance - Are You Aware 7"
The elephant in the room about Clearance is that it's virtually impossible to write about them without at least making a passing reference to Pavement. I'm sure there will come a day (if it hasn't already come) that the guys in Clearance will get pretty sick of that comparison. For now it's still an apt reference point, especially for those that may not have yet heard of this wonderful band. What really makes Clearance stand out is the breezy way they cruise through their songs while still projecting a laid back intensity that lets you know they're not just going through the motions. The churning guitars in A-side "Are You Aware" propel the song forward. It lurches into a screechy and jagged guitar solo before jumping right back on track, only to be derailed by a sleepy, but absolutely perfect, mellowed outro. On the B-side "Owner/Operator" the vibe is a more laid back as the vocals glide over jangly chord progressions. Things come to a head with the hooky chorus full of noodling guitar dynamics and a super catchy melody. The download that comes with this 7" gives two additional bonus tracks. Both are nice, but neither are on the 7". It's good to have more songs from these guys, but I do hope they end up on wax at some point.